The Coral Beauty (Centropyge Bispinosa) is one of the most popular angelfish species. This dwarf angelfish only grows to about 4 inches making it a common inhabitant of medium to large fish only tanks as well as reef tanks. 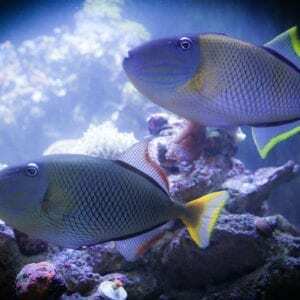 Its striking colors, hardiness and outgoing personality make it an excellent choice for a novice aquarist provided it gets basic marine essentials. While the Coral Beauty can be a great community fish certain guidelines must be maintained to avoid potential problems. Housing more than one Coral Beauty isn’t safe unless the tank is over 100 gallons, especially two males as they will fight to the death. Although generally considered reef safe, the Coral Beauty may still need monitoring as they can nip at corals in an attempt to eat the coral’s mucus secretions. Provide plenty of live rock and hiding places as well as stable water parameters. This dwarf angel will also help to control algae and vegetable matter should make up of most of its diet. With a well fed coral beauty and in a decent sized aquarium the changes of them bothering any coral are minimized. Feeding your dwarf angel twice a day if there is enough algae present is sufficient. This species is somewhat invertebrate safe and for the most part leaves shrimp, crabs, snails and starfish alone. They may however try to eat the slime layer off of clams and nip at feather dusters if not properly fed. 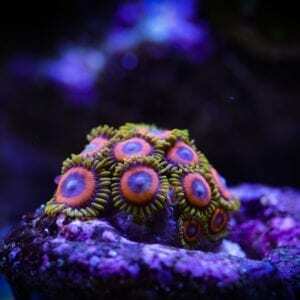 related :Dwarf Angels – Are they reef safe? Overall the Coral Beauty would be the first dwarf angel recommended to beginners for its color, size, temperament and hardiness.